Give chicken the night off with Beef and Vegetable Skillet Bake. 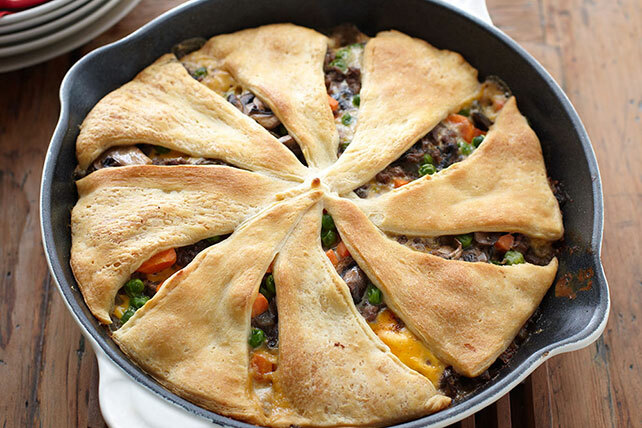 Crescent roll dough gives this beef and vegetable skillet an easy and impressive crust. Brown meat in large ovenproof nonstick skillet. Add mushrooms and onions; cook 8 to 10 min. or until liquid from mushrooms is cooked off, stirring occasionally. Stir in frozen vegetables and soup; bring to boil. Add VELVEETA; stir. Remove from heat. Unroll crescent dough; separate into 8 triangles. Place over meat mixture, with short sides of triangles along edge of skillet and points overlapping in center. Bake 12 to 15 min. or until crust is golden brown. Remove from heat. Let stand 5 min. before serving. Serve with a mixed green salad and cold glass of fat-free milk to round out the meal. Substitute frozen corn or your favorite frozen vegetable mix for the peas and carrots. Prepare using reduced-fat reduced-sodium condensed cream of celery soup. If you don't have an ovenproof skillet, you can instead wrap the handle of a regular skillet with several layers of foil before using as directed.